Announcing Irene MacWilliam Workshops June 13 and 14th! At our March meeting we were excited to announce that we are holding two workshops from Irene MacWilliam! 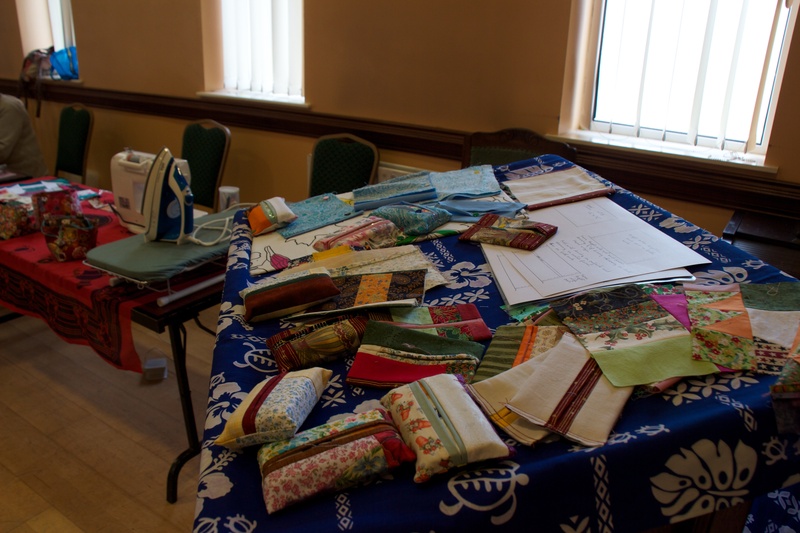 Come and spend an afternoon learning and having fabric-fun in the company of the celebrated patchworker and textile artist Irene MacWilliam, all the way from Belfast! Irene has exhibited all over Ireland, the UK, Europe and America and has won more prizes for her work than there is room here to list and is a sought after teacher. This is likely to be a popular class and places are limited, so secure your place asap! Various shapes will be explored : squares, diamonds, triangles. These produce double sided units that can be made into decorations, wall-hangings, fabric boxes or full-size quilts. We’ll also look at other origami based patches. This fun class is suitable for all levels of ability. The class will run after the meeting, in the Sacred Heart Hall on Saturday 13th June, approximately 1.30pm to 3.30pm. Bring a packed lunch. Tea and biscuits will be provided! • FABRIC – at least ¼m each of 3 or 4 cotton fabrics. Wide striped fabric works well. One fabric should be plain e.g. cream calico. This workshop covers free machine control …. drawing, cut work cobwebs, cord making, perfect circles, sequins by machine and various tricks on how to get the most out of your sewing machine. What about tensions? Mini lectures on care of your machine and on needles and threads. All levels of ability. The class will run on Sunday 14thth June, in the Sacred Heart Hall, prompt start at 10.00am sharp to approximately 3.30pm. Bring a packed lunch. Tea and biscuits will be provided! • Zig-zag sewing machine, with all accessories and instruction book. Don’t forget your foot pedal and transformer if required. For more information about Ms. MacWilliam, check out her website here. What a turnout at today’s meeting! What a fantastic turnout we had at today’s meeting. We started out with announcements and then moved on to Show and Tell. And the show and tell? 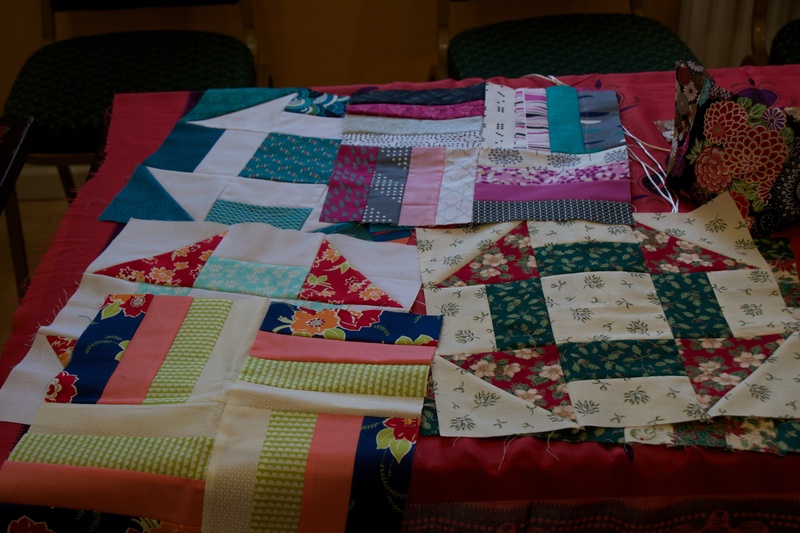 How inspiring are these quilts? Well done ladies! Fantastic work! We then moved on to the Block of the Month project, debuting our Churn Dash block. Due to the fact that our speaker had the flu, several of our members stepped up and provided demonstrations. And a Japanese Rice Bag demonstration. You can find the handout for the rice bag demo here. Our next meeting is April 11th. It will be our AGM and we’ll have Sandra Jansen speaking about Improvisational Piecing. Start working on your show and tell now! Unfortunately, we need to cancel our workshop scheduled for tomorrow, March 14th. Ms. Shawcross is ill, and will be unable to teach. Best wishes for a speedy recovery! Meeting this Saturday, March 14th! Can it be meeting time already? How time flies when you’re enjoying yourself. 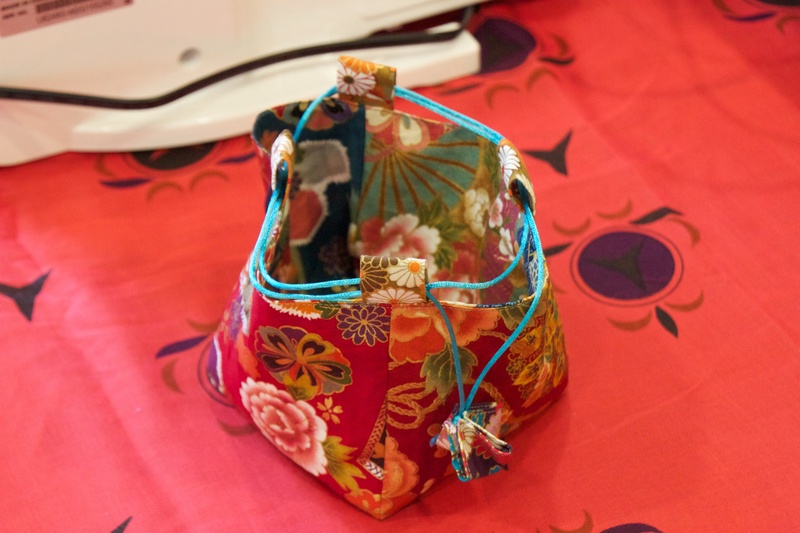 There is a plethora of really interesting workshops and classes for all of us at the moment. 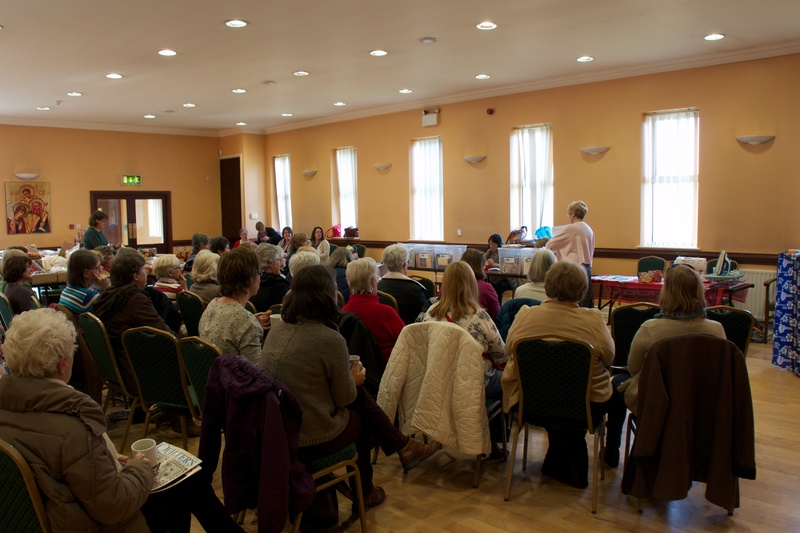 We hope we can compete with a tempting meeting next Saturday 14th March at 10 am in the Sacred Heart Hall. But there is no meeting without you! So see you on……. SATURDAY 14th MARCH at 10 am. Please Note : at the time of sending this email there is only one place left on our afternoon workshop with Arlene Shawcross. Congrats to those who are signed up. We will be sending out copies of the bring list this week – apologies if you already have one. Executive : Applications are requested for the posts of International Representative and Crafts Council of Ireland Representative by 31st March to IPS Secretary, PO Box 45, Blackrock, Dublin. Details in the Newsletter. Hands Across the Border Exhibition, ‘Reflections’. Details and application form in Autumn Newsletter. Note : These need to go up to Dublin by the 21st March so if you have an entry for this bring it along on to the meeting on 14th March. June 13th Meeting : Irene MacWilliam comes to the Southern Branch! Irene will be our speaker in June and will also be giving not ONE but TWO workshops that weekend. Information and signup sheets will be available at the March meeting.